Where to Stay in Belgrade: Hotels & Accommodations We Love! 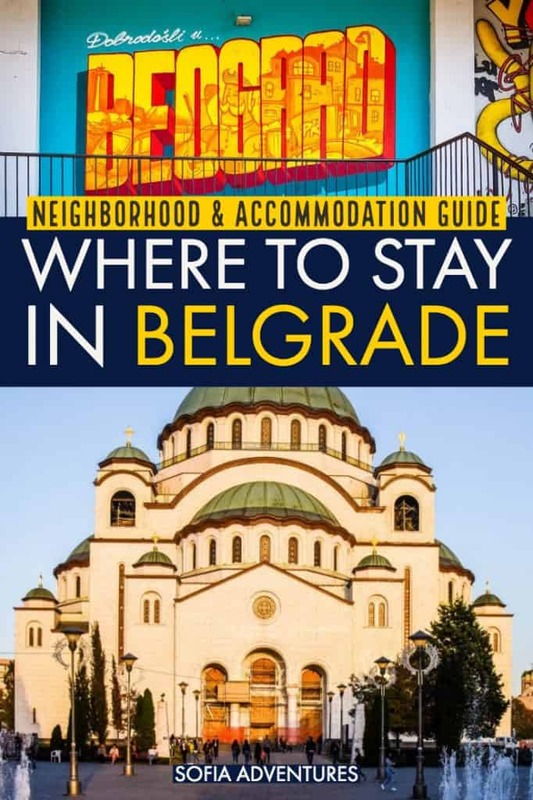 Belgrade is one of our favorite cities in the Balkans… I mean, we did write the longest guide to Belgrade possible with almost 12,000 words and 101 things to do! 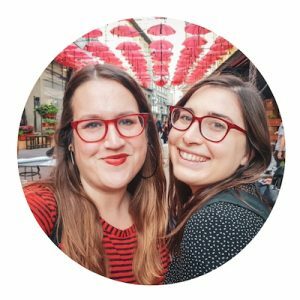 Between the two of us, we’ve spent about two months in Belgrade alone and as a result, we know Belgrade neighborhoods quite well and therefore we can offer you some great advice on where to stay in Belgrade! No time to read the post now? Pin to save it for later! 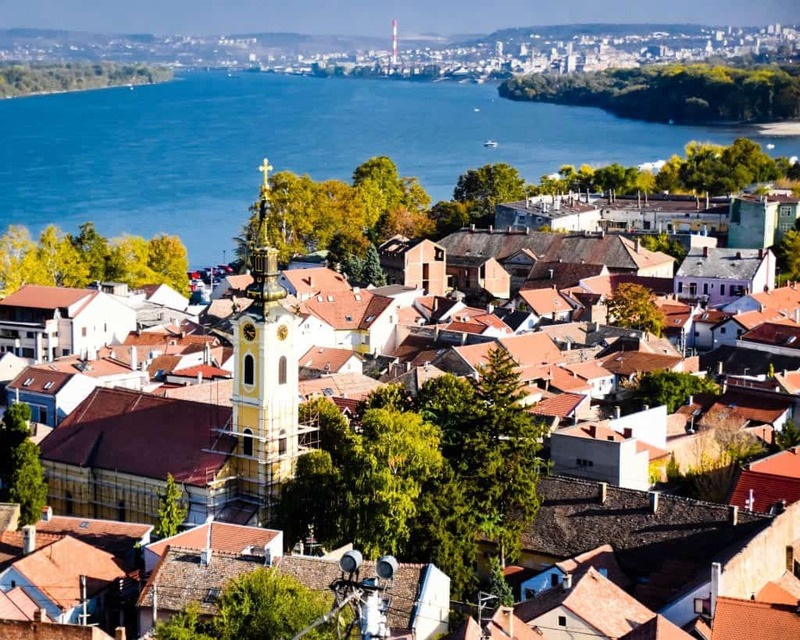 Belgrade is a pretty spread out city, separated in two main sections – the more touristic right bank that includes the city center and the more residential left bank, which includes the Communist blocks of Novi Beograd as well as the quaint historic suburb of Zemun. Thankfully, Belgrade is quite easy to get around with a comprehensive public transportation network and affordable ridesharing apps like Car.Go, Belgrade’s own version of Uber which we love for getting around the city (just add a Serbian sim card). Here are the seven Belgrade neighborhoods we recommend, which we’ll go into more detail about below: Stari Grad/Terazije Street, Dorcol, Vracar, Palilula, Savamala, Novi Beograd, and Zemun. Undoubtedly the most popular area to stay in Belgrade, Stari Grad (Old Town) is really the heart of it all. You’re within a short walk of Kalemegdan Park, Belgrade Fortress, several important churches and monuments, Republic Square, and the heart of it all, Knez Mihailova pedestrian boulevard. Here you’ll find plenty of historic buildings that are ultra-Instagrammable and well-worth seeking out. You’re also located close to where most walking tours will depart, plus you’re smack dab in between two great nightlife districts (Dorćol and Savamala) so you have access to quieter bars and clubs (Dorćol) or wilder nightlife (Savamala and its splavovi). 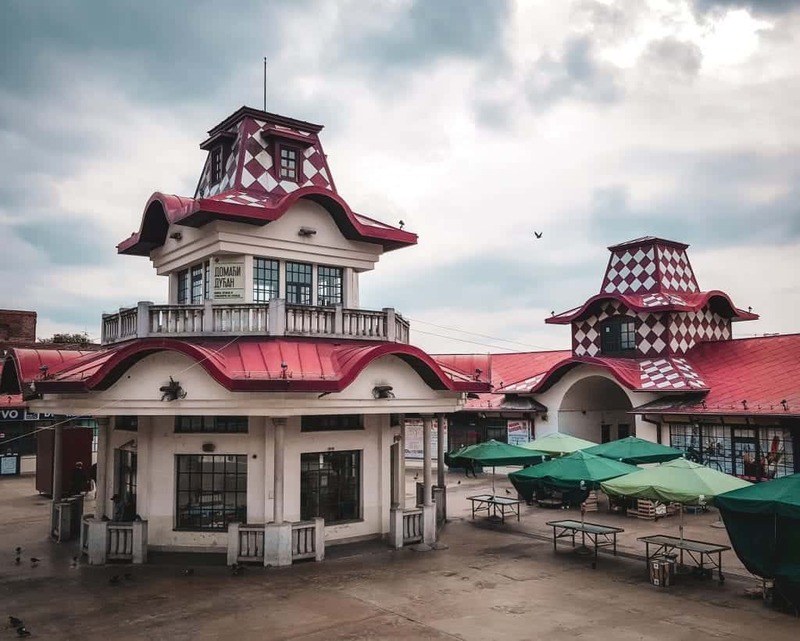 Don’t miss a traditional Serbian meal at the red-umbrella’d Manufaktura or checking out the National Museum of Belgrade, newly reopened after a nearly decade-long absence. One of the most popular hostels in Belgrade is Balkan Soul Hostel, located in Stari Grad and a convenient walk from all the hot spots like Kalemegdan Park, Belgrade Fortress, and the splavovi on the Sava River. Every bed has its own charging area and lights, which are essential to me when picking a hostel. It has a social atmosphere and friendly staff who can make your stay in Belgrade even more charming. Check out reviews, pictures, prices, and availability here. If you want a more traditional Belgrade accommodation option, we recommend the affordable four-star Zepter Hotel on Terazije, one of our favorite streets in all of Belgrade. It has all the amenities you’d expect from a 4-star hotel, like a gym room, in-room coffee machine, and a fantastic daily breakfast. Check out photos, reviews, prices, and availability here. 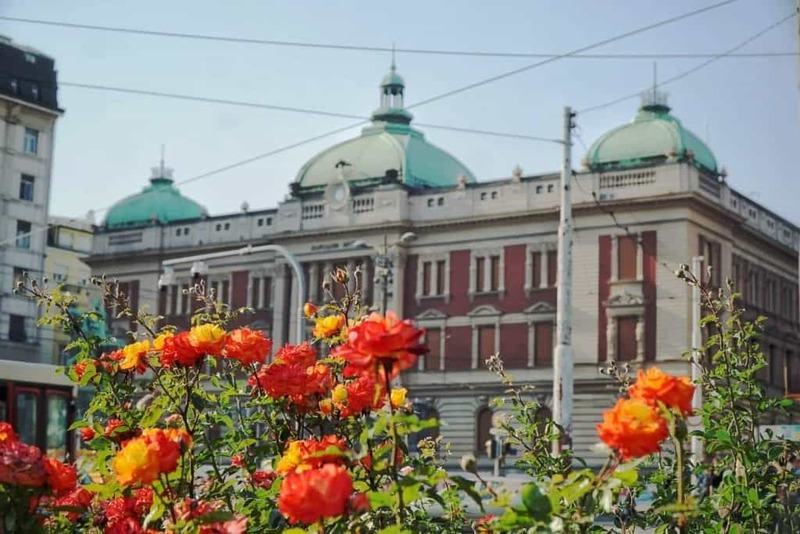 We’d be remiss if we didn’t suggest the classic luxury option in Belgrade, Hotel Moskva – one of our favorite buildings in the city and a classic haunt of famous politicians, musicians, actors, and other celebrities who pass through Belgrade. It’s also surprisingly affordable for its caliber! With a renowned spa, delicious restaurant (don’t miss the moskva schnit cake – we love it! ), and beautifully designed rooms, it’s one of our favorite places in Belgrade and the location is unbeatable. However, it’s almost always sold out, so be sure to check in advance if possible and hope you get lucky! Check out prices, reviews, photos, and availability here. If you want a more modern take on luxury (or if Hotel Moskva is sold out, which happens often!) in a beautiful boutique hotel that is classy to the nines, we recommend Boutique Garni Hotel Townhouse 27. This hotel is beautifully designed in rich colors, with key details like fresh flowers in the rooms and a gorgeously-presented breakfast. The staff is helpful and courteous and you’ll love the location just off Knez Mihailova in Stari Grad. This is hands-down our favorite neighborhood in Belgrade for a variety of reasons. For one, it’s really close to Stari Grad and all its attractions such as Belgrade Fortress and Knez Mihailova Street. But it’s decidedly quieter and more residential, giving you that true Belgrade neighborhood vibe that makes you feel that you – for a time – are a local. But if we’re being really honest, it’s because a handful of our favorite international Belgrade restaurants are here – special mentions to Nachos for Tex-Mex and Istok for insanely good Vietnamese/Korean/fusion food. 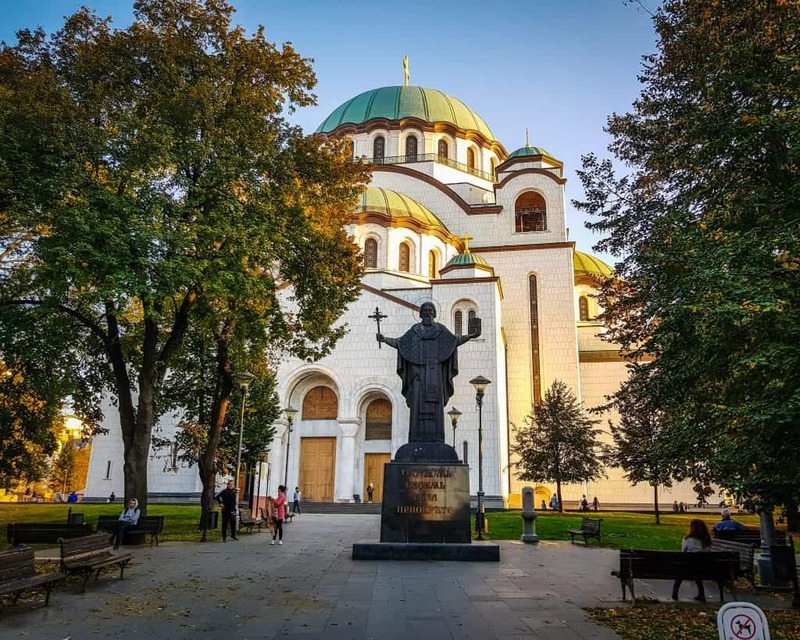 This is also where you’ll find a lot of the hippest Belgrade coffee shops, as well as a large number of cool bars that offer a slightly tamer version of the legendary Belgrade nightlife scene. Plus, Skadarlija is part of this district, and it’s one of the cutest places in Belgrade. One downside to Dorćol – it’s quite hilly. Pretty much all the streets going up to Stari Grad are on a serious incline (the other streets are pretty flat) so if you are going from down near the waterfront up to Stari Grad, your calves will be feeling the burn. Nearby popular Skadarlija Street, Hostel El Diablo is a highly-rated option in the trendy Dorćol district. There are plenty of delicious restaurants, cool kafanas (coffee houses), and bars in the area. The hostel is cheap and cheerful, not super modern but offering basically everything you’d want for a low price. There is a well-stocked full shared kitchen, a library, a terrace, and common lounge areas for socializing. The rooms are bright and colorful, and the bottom bunks have privacy curtains (tough luck for upper bunks). Showers are basic but functional. Check prices, photos, reviews, and availability here. For an affordable yet beautiful place to stay in Dorćol, check out Passpartù Home, a gorgeous boutique hotel in the heart of Belgrade’s hippiest quarter. The lounge areas are endlessly inviting, with plush leather couches and books for you to peruse. The rooms are warmly and richly decorated with unique touches that make the hotel feel not so generic. But best of all is the beautiful spa center, which makes you think the hotel should be much more expensive than it is. It features an indoor pool, sauna, spa, hot tub, and hammam for an affordable extra charge. Vračar is where I (Allison) stayed the very first time I visited Belgrade and I’m so glad I did. Because it’s a little out of the city center, it’s probably not a neighborhood I would have explored independently… but I would have been missing out, because Vračar is cool. 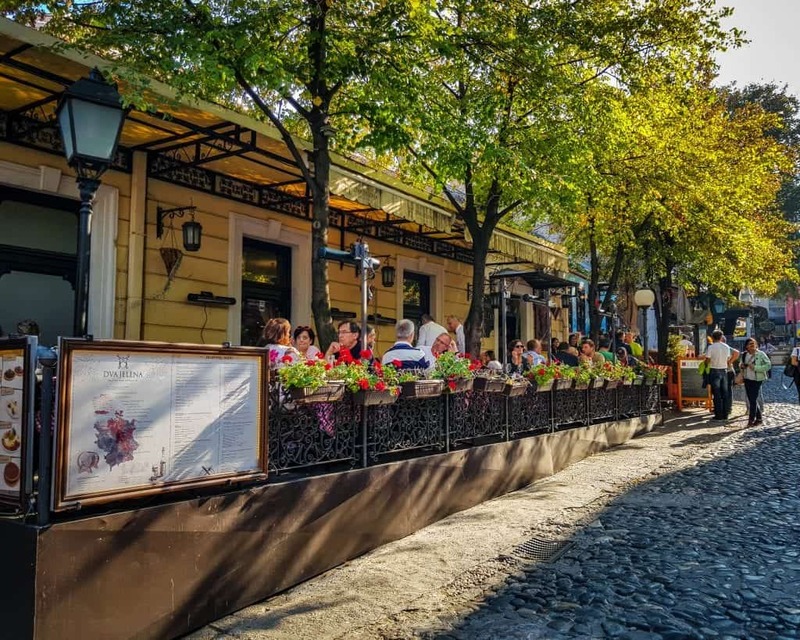 This is where you’ll find the best brunch in Belgrade, Kafe Kozmetičar (honorary mention to fellow Vračar brunch spot, Dokolica Bistro) as well as plenty of delicious coffee shops, like Koki and Kafeterija (which has many branches but a great one in Vračar). There are also plenty of hip restaurants and the best Thai in Belgrade, Thai Fazon… not like that’s a particularly competitive category, but it’s important knowledge nonetheless. Vračar is definitely a more off the beaten path place to stay in Belgrade and it’s one of my favorites for that reason, because you get away from the tourists and a true insight into daily Belgrade life. However, that comes with being about a 30-minute walk or 10-minute tram ride away from the heart of the action, and taxis home after nightlife may be a little more pricy (again, we recommend using CarGo to avoid price gouging). If you want a great hostel in Vračar, City Break Hostel is the best around. It has affordable twin or double rooms as well as dorm rooms if you are traveling solo. Previous guests have raved about the kindness of the hostel owner, the homey and friendly vibe of the hostel, and the cleanliness. Check photos, prices, reviews, and availability here. If you want to stay in Vračar (to be exact, this hotel is a bit between Vračar and Savamala) but have a bit more to spend, I highly recommend MARK Hotel. It’s one of the most beautiful boutique hotels in this part of Belgrade. The lobby makes it look like a hotel that would demand three times its price – but because it’s Belgrade, it’s rather affordable. The rooms are incredibly modern and beautiful, especially the marble bathrooms (swoon) and the bedrooms with wood and turquoise detailing (double swoon) – they have really great design. But what appeals to me most besides the design is the fabulous breakfast spread. Chia pudding with fresh berries? My inner millennial like, can’t even. Check photos, prices, reviews, and availability here! For a truly incredible luxury boutique hotel, check out SAINT TEN,.housed in a cultural heritage building. It’s 300 meters from Saint Sava, one of the most beautiful places in Belgrade. The rooms are ginormous, with huge king beds that just invite you to flop down on them. They have beautiful details, from potted orchids in every room to wooden floors to unique handcrafted furniture and bathrooms made of natural stone with rain showers (god I love rain showers). The rooms have smart TVs, free non-alcoholic beverages from the minibar, tea and coffee makers. The amenities are next level, with something called cardio sauna (to me, that sounds like a heart attack waiting to happen but is probably really good for you), as well as more normal-sounding things like fine dining at their SANCTUS restaurant, a trendy lobby bar, massage center, and soundproofing. Check photos, guest reviews, prices, and availability here! A compact waterside district in the midst of a renewal, Savamala is named for its proximity to the Sava side of the river. It’s a short walk from Stari Grad and encompasses some popular sights like the Old Belgrade Railway Station, Zeleni Venac, and parts of the new Belgrade Waterfront development (with delicious restaurants like Ambar). But more than its sights, Savamala is known for its nightlife. Whether its tamer places like Prohibicija Pre Club and Jazz Basta or wilder nightlife on the banks of the Sava river (though admittedly, the better splavovi are located on the other side of Branko’s Bridge in Novi Beograd). We love Klub 20/44 and Lasta. If you want a cozy feeling hostel, Hostel Home Sweet Home in the Savamala neighborhood of Belgrade is a fantastic choice. Its central location close to Knez Mihailova Street and other Belgrade must-sees makes staying here ultra-convenient. It’s sunny and open, with options for dorm rooms as well as affordable single and double rooms for travelers who want a little more privacy without paying a fortune. It’s one of the best-rated options in town, so we recommend you book early if you have your heart set on it. Check out availability, photos, reviews, and book in advance here. Literally right across from the bus station, I popped into Jump Inn as my first port of call in Belgrade the last time we arrived there as we didn’t have SIM cards yet and were loathe to get ripped off by a taxi driver at the bus station. 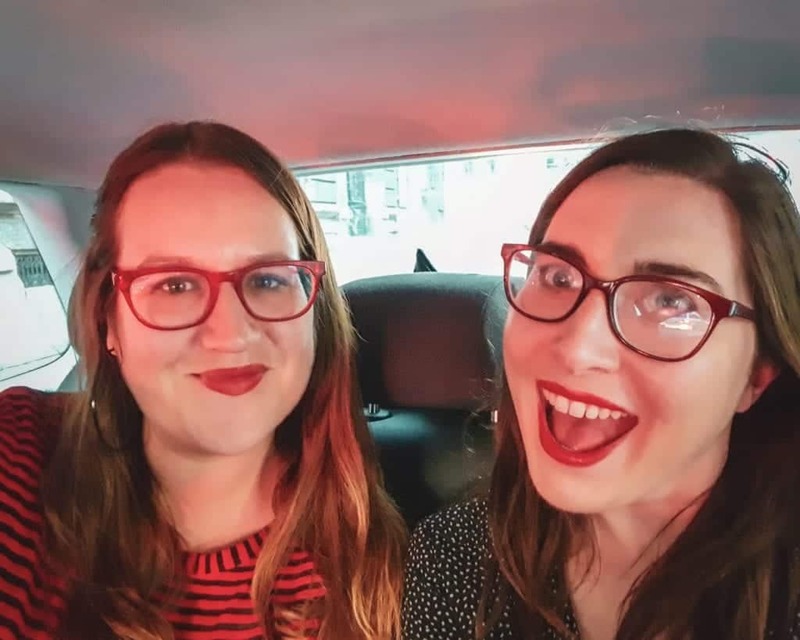 The staff was incredibly helpful and called us a taxi right away and were just super kind to us, even though we came across as two scruffy and tired bus monsters. Sitting in their lounge area, we absolutely loved their decor and vowed to stay there on a future visit! Besides their amazing location and kind staff, the design of the rooms is gorgeous: light lilac and white tones that make the rooms feel ultra-bright and spacious, gorgeous touches and details, modern bathrooms, welcoming lounge areas, and much more. There is also a massage center, an on-site restaurant, and smart TVs in each room. Check out photos, user reviews, prices, and availability here! If you want blow-out over-the-top luxury in Savamala, the perfect crash pad for wild nights out in Belgrade, head to the beautiful Amsterdam Hotel! With a rooftop restaurant offering crazy-beautiful views, an indoor pool, a spa and wellness center with massage rooms available, and even saunas, you will fall in love with this hotel and may never leave (but you should, because you’re in the best nightlife district in town!). The design of both the hotel’s public spaces and the rooms themselves are incredibly modern, with beautiful wide beds, plenty of seating space, full-length mirrors, beautifully designed bathrooms, and more. They offer everything from twin rooms up to penthouse apartments! Check out photos, user reviews, prices, and availability here. Halfway between the two hipper neighborhoods of Dorćol and Vračar, Palilula is a quiet and residential area that Stephanie and I called home for two weeks on our most recent trip to Belgrade. 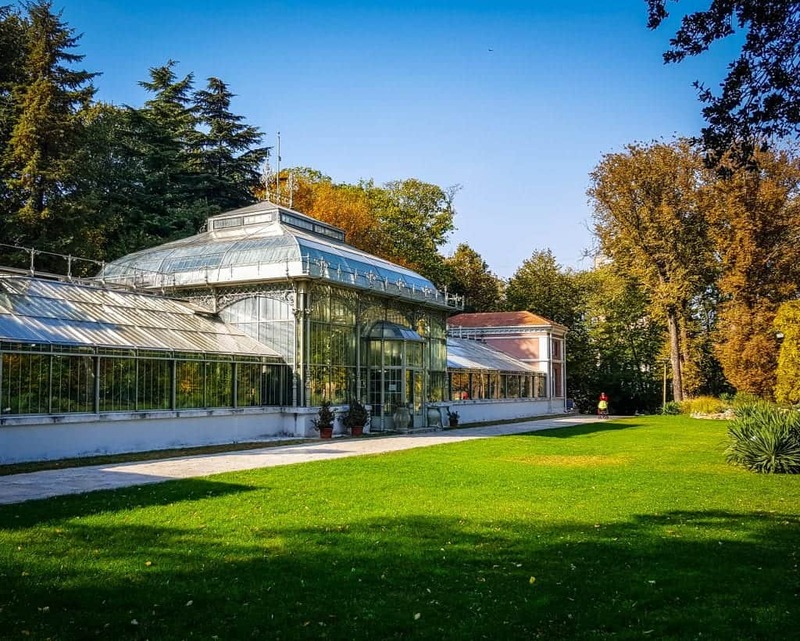 It’s not the most exciting part of town – the closest thing it has to a ‘claim to fame’ are the Jevremovac Botanic Gardens, which are lovely but not really a huge Belgrade must-do. It’s also close to the St. Mark’s Cathedral and some other interesting buildings near there. However, I fell in love with the peacefulness of Palilula and how easy it was to get downtown with just a short walk or cab ride if you were feeling lazy. Budget travelers love Guest House Miss Depolo for its affordable private rooms that make you feel like you’re paying hostel prices but with plenty of privacy (dorms are also available if you’re traveling solo). Some rooms have private bathrooms and others are shared so just be sure to confirm before booking. People love the free parking, the quiet neighborhood, free breakfast, the kind host Maja, and the ease of getting around Palilula. It’s not the hippest looking option, but it is quiet, private, and convenient! Check out reviews, photos, prices, and availability here. The stylish 88 Rooms in Palilula is a great mid-range Belgrade hotel for travelers who want to stay a bit outside the center in a quieter neighborhood but still have all the perks of a high-quality hotel. The interior is just as modern as its exterior, with lovely lounge areas, colorful rooms, delicious breakfast buffets, and amenities like a fitness room, bathrobes and slippers, a library, and a massage center. I actually stayed just around the corner from the impressive Hotel Constantine the Great my last time in Palilula and was extremely impressed every time I walked past it (which was pretty much every day for two weeks). The rooms are elegantly designed, with gorgeous stone-tiled bathrooms and super spacious rooms that are almost more like suites for how large they are. The breakfast buffet is a gluttonous dream and basically everything about this hotel screams luxury (yet it’s cheaper than other similar options as it’s not in Stari Grad). If you’re dreaming of chasing concrete in Belgrade, Novi Beograd is the place to be. Here is where you’ll find a lot of the famous concrete blocks that were built during the Communist era, as well as some interesting Yugoslav-era spomeniks (memorials) and brutalist hotels such as Hotel Yugoslavia. But aside from that, you’ll also be close to all the hottest splavovi in town, so it’s also a great crash pad for partying as you can just walk back to your Belgrade accommodations once the night is over. It’s a little bit of a schlep to central Belgrade, but if you are more focused on discovering the Communist history of Belgrade, this is the place to be. A new Belgrade hostel option in Novi Beograd, I haven’t heard too much about Hostel amd but initial reviews appear promising! It has a gorgeous shared kitchen, modern wooden bunkbeds (no metal noises keeping you up as your bunkmates toss and turn), reading lights and outlets next to each bed. There are no privacy curtains, but the rooms are quite airy and bright. However, the rooms are a tiny bit on the small side, but there are lockers to store your stuff to keep them out of people’s way. If you’re looking to check out Novi Beograd on a budget, give it a try! There are so many great options in this price-range — Belgrade really excels at providing great value when it comes to accommodations in this price tier. 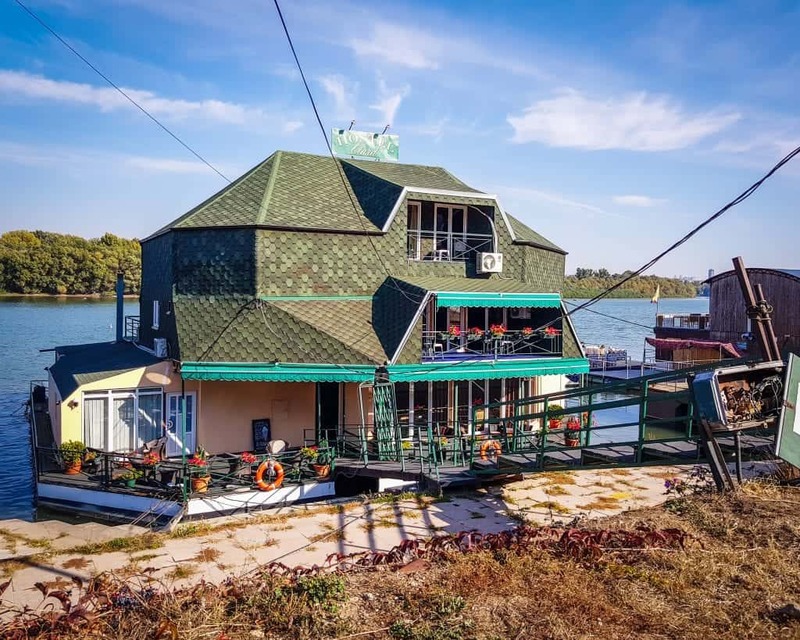 One fun option is a floating hotel on the confluence of the Sava and Danube Rivers, San Art Floating Hostel & Apartments. While it’s a little outside of the main action of Belgrade – except for the nightlife! – I love the floating deck where you can have sunset drinks, and I like the that the décor is a little bit nostalgic, with details like rotary phones and old radios. Check out guest reviews, photos, prices, and availability here. Extremely stylish and modern, Falkensteiner Hotel is one of the best-loved hotels in Novi Beograd with over 800 reviews and an average Booking score of 9.3 at time of writing. The exterior has a funky architecture that Brutalist fans will surely enjoy, but the interior is modern and over-the-top beautiful. Some rooms feature crazy-baller perks like a bathtub in your actual room and massive seating areas. There’s also a killer spa with a sauna and hammam, a state of the art fitness center, a hip bar to enjoy cocktails at, and plenty of trendy lounge areas. The best place to stay if you’re having a luxury party weekend and want to be close to Belgrade’s hottest clubs! Formerly not part of Belgrade and actually part of the Austro-Hungarian empire for many years, Zemun is a unique place to stay in Belgrade for its distinct architecture and aesthetic that almost makes it feel like another city. Here you’ll find plenty of colorful building facades, Baroque architecture, and cobblestone streets with trendy cafés and bars. It’s much quieter than the traffic-congested city center, so it’s great if you like a bit of a calm oasis while still having city conveniences. Zemun has some attractions of its own, particular the beautiful Gardoš Tower which was built by Austria-Hungary in celebration of 1000 years of the Hungarian state (that’s why its other name is the Millennium Tower). Other interesting sights in Zemun include the area around Masarikov Square (Trg) and the waterfront. There aren’t a ton of hostels in Zemun but of those that are there, Hostel 1910 is certainly the best with an average Booking rating of 9.5 – pretty high for a hostel! The rooms are super spacious for a hostel and have huge windows, keeping it from getting that ubiquitous “dorm funk” from people who haven’t done laundry in too long (ahem). There’s a nice outdoor lounge space to socialize in, and guests love that the hostel is super clean and that the kitchen is well-stocked. Also, reviews indicate there’s a dog so BRB, booking a bunk now. Check out guest reviews, pictures, prices, and availability here. 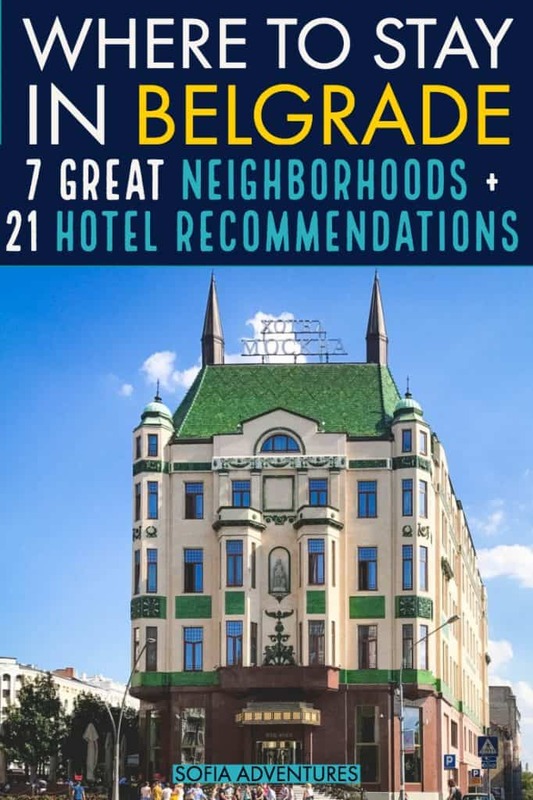 I always end up recommending Garni Hotels in Belgrade and this is no exception: Garni Hotel D10 is one of the best-reviewed mid-range options in Zemun. The rooms have beautiful, warm, and wooden decor that are really soothing to come back to after a long day of traveling. The common spaces are modern and trendy, welcoming guests to lounge outside their rooms if they wish. One super awesome perk? Free bikes, which is a great way to discover the calm streets of Zemun. It’s also great if you’re traveling to Belgrade by car as it has free parking, not common in much of the city. Plus, it’s super affordable for the high quality. Ever wanted to live inside a spa? Same. Marconio Wellness Club & Apartments is the perfect place for the weary traveler who wants to relax in Zemun… or for a couple looking for a romantic place to unwind and spend some quality time together. This aparthotel features one- and two-bedroom suites with literal private freaking pools and/or private saunas INSIDE THE SUITE, and they’re not even that expensive (I found a 2-bedroom suite for $150 per night when searching). If you are looking for an ultra-private, ultra-romantic place to stay in Belgrade, this is it. Unless I’ve already moved in, that is. There are only two rooms, so book early. If you’re planning a trip to Belgrade, make sure to travel with a valid travel insurance policy. If you’ll be spending time in the city, driving, or doing any outdoor activities like biking or hiking, you need to be covered in case of an emergency. Travel insurance covers you in case of theft or an accident, which can save your trip if there’s an incident.